Brand New 12pc Complete Front Suspension Kit. Fits Driver and Passenger Sides. 2x - Front Lower Left & Right Ball Joint - K9802. Control Arm + Ball Joint. 2x Front Stabilizer / Sway Bar. 1x Front Right Outer Tie Rod End. 1x Front Left Outer Tie Rod End. 2x Front Inner Tie Rod End. 2x Front Boot & Bellows - BT-013. With an OE design, simple installation and long life as a guarantee. 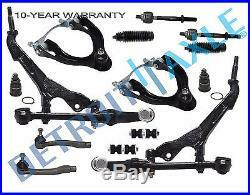 The item "New 12pc Complete Front Suspension Kit for Honda Civic Excludes SI Models" is in sale since Wednesday, October 28, 2015.